After an extensive process of revision, the new edition of the Novum Testamentum Graece (NA28) is now available! 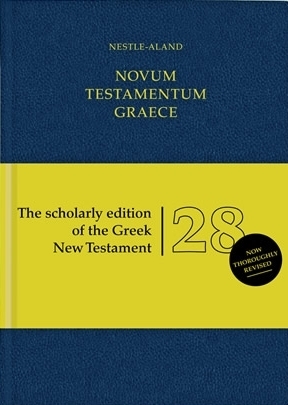 The NA28 set a new standard among Greek New Testament editions with its revisions and improvements. The Catholic Epistles have been modified in more than 30 places to bring them into alignment with the Editio Critica Maior. The structure of the apparatus has been simplified by eliminating certain features of the previous edition such as the use of sed and et to combine variants or the distinction between consistently cited witnesses of the first and second order. The apparatus also adds readings from the newly discovered Papyri 117-127, bringing interesting perspectives to the book of Acts in particular. The Mounce Parsing Database was created by Dr. William Mounce, the author of the best-selling Greek textbook Basics of Biblical Greek Grammar. Dr. Mounce's parsing system reflects his unique approach to Greek grammar, blending the best of traditional and modern understandings of Greek grammar in an eclectic manner. The result is a simple, yet accurate system of parsing that provides the basic grammatical features for each word as well as a short gloss. This bundle also includes the Concise Greek-English Dictionary of the New Testament, which provides a definition for each Greek word. The appropriate lexical entry is hyper-linked from the words in the GNT text, allowing you to open the dictionary whenever you view parsing information. The dictionary is also independently accessible, so you can look up words without linking from the Greek text. Please Note: this resource contains the text of the NA28, the Critical Apparatus, and the Mounce Parsings. It is also available containing the text and apparatus only (no parsing) NA28 with Critical Apparatus (no parsings). Upgrade Pricing Available! If you've previously purchased the Greek New Testament (NA27) with Critical Apparatus, Mounce-Koivisto Morphology, and Concise Dictionary, you can purchase this item for a special upgrade price. The upgrade price will be visible when you log in to your Olive Tree account and add the item to your cart (NOTE: Upgrade pricing is only available on www.olivetree.com, and not via in-app purchase).